Prohibition (acylic on canvas) 36" x 24"
Prohibition in the United States was a nationwide constitutional ban on the sale. production, importation, and transportation of alcoholic beverages. 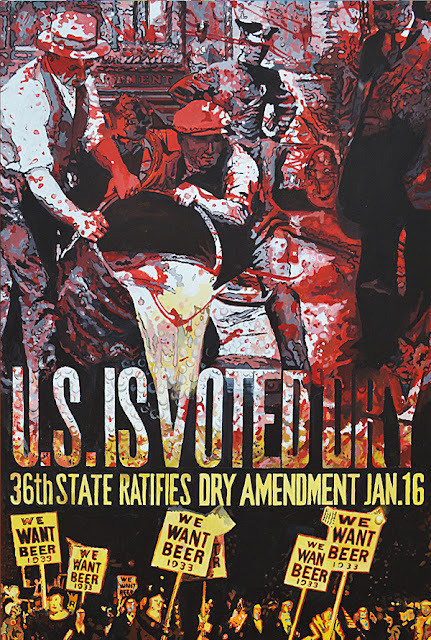 It remained in place from 1920 to 1933, after which it was repealed by ratification of the 21st Amendment. During the 19th century, alcoholism, drug abuse gambling addiction and other social ills led to activism to cure the perceived problems in society.The"dry" crusaders, a movement led by rural Protestants and social progressives believed that by banning the ability to purchase alcohol, people (mostly men) would become more socially responsible. The movement did, in fact, reduce alcohol consumption a socialize a significant proportion of the population in temperate habits, but it also created unintended consequences such as the growth of urban crime organizations.Support for prohibition grew less each year it was enacted and much needed tax revenues were lost when most needed following the Great Depression that began in 1929. In recent times, the ban on marihuana has faced a similar conflict, between those who think its use leads to drug addiction and use of more dangerous drugs, and those who believe it does less harm than alcohol and provides relief of symptoms resulting from many physical and mental afflictions.